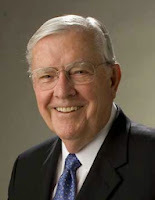 Elder M. Russell Ballard (born October 8, 1928 — 88 years ago today) was called as a Seventy in 1976, and has served as a member of the Quorum of Twelve Apostles since 1985. 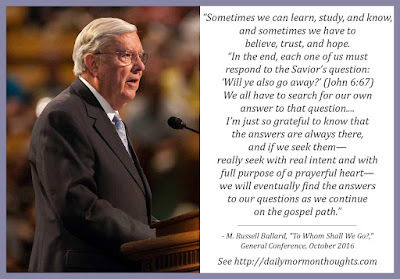 "Brothers and sisters, accepting and living the gospel of Christ can be challenging. It has always been thus, and it ever will be. Life can be like hikers ascending a steep and arduous trail. It is a natural and normal thing to occasionally pause on the path to catch our breath, to recalculate our bearings, and to reconsider our pace. Not everyone needs to pause on the path, but there is nothing wrong with doing so when your circumstances require. In fact, it can be a positive thing for those who take full advantage of the opportunity to refresh themselves with the living water of the gospel of Christ. "The danger comes when someone chooses to wander away from the path that leads to the tree of life. (See 1 Nephi 8:20–30.) Sometimes we can learn, study, and know, and sometimes we have to believe, trust, and hope. "My heartfelt plea is that we will encourage, accept, understand, and love those who are struggling with their faith. We must never neglect any of our brothers and sisters. We are all at different places on the path, and we need to minister to one another accordingly. "Just as we should open our arms in a spirit of welcoming new converts, so too should we embrace and support those who have questions and are faltering in their faith." I loved this talk by Elder Ballard in the recent conference. He speaks to those who are struggling with their faith or testimony, offering suggestions and encouragement on keeping a good perspective in spite of doubts or concerns. I can relate to the hiking analogy in the first paragraph quoted here! I know people who never stop to rest on a hike; they have developed the energy or stamina to continue at an impressive pace. And there are some who symbolically do the same in life, in understanding, in testimony. But it's also very normal and very appropriate, as Elder Ballard indicates, to stop and reconsider, look around, evaluate pace and direction. As long as those things are done with the proper eternal perspective! One of the most profound summaries of life was this simple statement, describing the two situations we will all encounter in our journey: "Sometimes we can learn, study, and know, and sometimes we have to believe, trust, and hope." Both are appropriate. The other great thought of this excerpt was the encouragement to treat one another with understanding and respect, including (and perhaps especially) those who are unsure about their faith. If they ever needed an understanding, loving friend, it would be at a time like that.